Updated 15-April-2004 - See here! Welcome to Expressions! I hope you enjoy what you find here. This archive is for those Tomrrow People fanfics which aren't finished or contain "adult" content. Now, I know you've got some questions, so let me address them now before you continue on. Why did you start this archive? Elementary, dear Watson. I started this archive because I felt those fan fictions that weren't finished or were of an adult nature needed a place all to themselves. The mainstream TPFICT mailing list was intended for gen-fic (as it should be) and since there are fan fictions which don't fit into the category of finished gen-fic, I felt there should be a place for them to go where they were welcomed. Anyone can contribute to the WIP section. However, you have to be over 18 or over to contribute to the adult section. If you are under 18 and have an adult fan fiction, email me and we'll discuss this in private, where I can make a decision. The ONLY requirement is that you have a WORKING email address at all times. I check email addresses at random, if yours bounces, I will remove your fan fiction. This is for your safety and mine. So notify me if you move and I'll list the removed fics here, so check periodically to make sure there wasn't a bounce, okay? What are all these strange words? Ahh, you mean things like gen-fic and WIP and slash. Welcome to the jargon of fan fiction. I have a dictionary in case you're wondering what it means and where it came from. There's lots of terms in fanfiction that can get confusing. So go and take a peek if you don't know what something means. 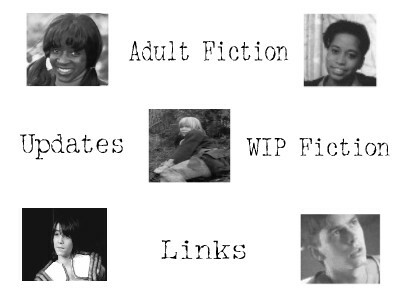 Okay, if this is a list for WIP and adult fic, why are there some completed gen fics? Because there are some fanfictions which are either part of a series or by an author already hosted here that I felt were so good that I wanted them to be here, too. I hate adult fic. I think it's sick. What can I do about this? Simple. Leave. Now. If you don't like what's here, then don't read. This is the internet and you have the freedom to direct your browser elsewhere. I realize that not everyone is going to like the idea of having their characters in adult situations. That's perfectly fine, and that means that you won't be on the mailing list. However, I would appreciate it if you'd refrain from flaming me or the authors here. If you do, the flames will be posted and you will be made fun of. Repeatedly. On a daily basis. If I have a finished fan fiction that isn't adult, can I put it here? That's the joy of having this archive. There are no hard and fast rules. If you've got the itching to put your fan fiction here, go ahead and send it to me. I will be MORE than happy to have you here (I will do a jig of glee atop my desk, in fact). This is a very open, free archive where just about anything goes. If I join the adult mailing list, do I have to join the WIP list or vice versa? Nope. You can join one, the other, or both. I made them into two different lists because I realize that the WIP authors might not all like adult fan fiction. And that's fine. We take all kinds here, and you don't have to like everything to post or be on a mailing list. That's the fun of diversity. How do I join these mailing lists? I have questions you haven't answered! Copyright 2003 to Megan Freeman. All stories are owned by their respective authors and no intent to infringe on any other copyrights has been made. If I have used an image that you think is yours, please, please, please, let me know that I can give you credit or take the image down. I don't want to infringe on anyone's rights, so if I've used something here wrongly, email me so I can fix it. Thank you.